As spring brings warmer water temperatures to the Land of Lincoln, crappies begin to move from deep water haunts toward their traditional spawning habitat. As they stage in the more shallow water, anglers seek them out. Two waters can present different fishing challenges while also containing a prominent crappie fishery. One is a long stretch of water with rocky bluffs and deep water close to shore. The other is shorter and much wider with a kind of bowl structure with great shoreline vegetation. The challenge of fishing for pre-spawn crappies is mostly finding them. This involves knowing their seasonal movements. The spawn dominates the habits of fish in spring. Water clarity is a factor in finding fish. Turbid water following flooding and low light penetration limits vegetation growth to shallow water. In very clear, undisturbed water the fish remain deep. As predators they seek preferred forage. Knowing where the forage is located goes a long way in finding crappies. Fishing for pre-spawn crappies requires stealth, patience, ability to read the water and a sound knowledge of the species. Crappies feed according to changes in weather and barometric pressure. They cause the fish to move tight to cover and become inactive. Successful anglers look for warmer water seeking out colored water, a windward shoreline, a dark soft bottom, shallow water, tributary streams and heat absorbing cover such as wood. Early on in the month crappies will be in shallower water on dark, warm days and deeper on clear ones. High water is common. Fish will often move up into the temporarily flooded vegetation. It is advisable to check a variety of depth zones and not overlook checking odd locations. Cold water crappies are not usually aggressive feeders. Fish slowly. They will not chase bait or lure very far. It is best to keep a lure right on their nose. Jigs are the bread and butter of crappie lures. A good assortment of leadhead jigs in 1/16th to 1/64th ounce, in crappie colors or white, black and yellow are basic, but not the end all. 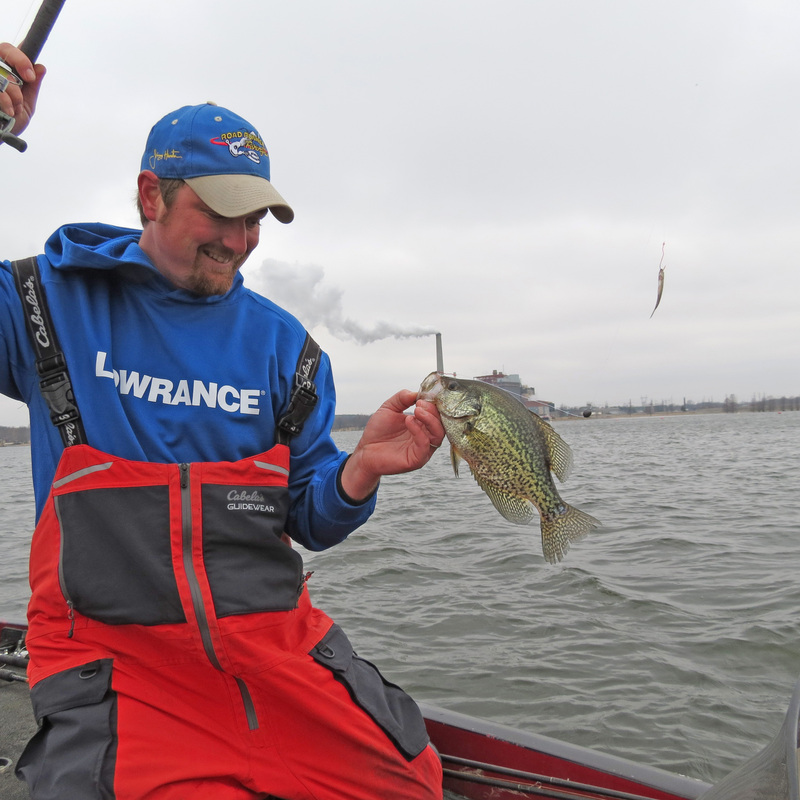 Other colors produce action, as feeding habits of the crappie can be finicky. Couple them with tube bodies of the same colors. For the natural bait aficionado jigs with minnows and wax worms are the ticket. 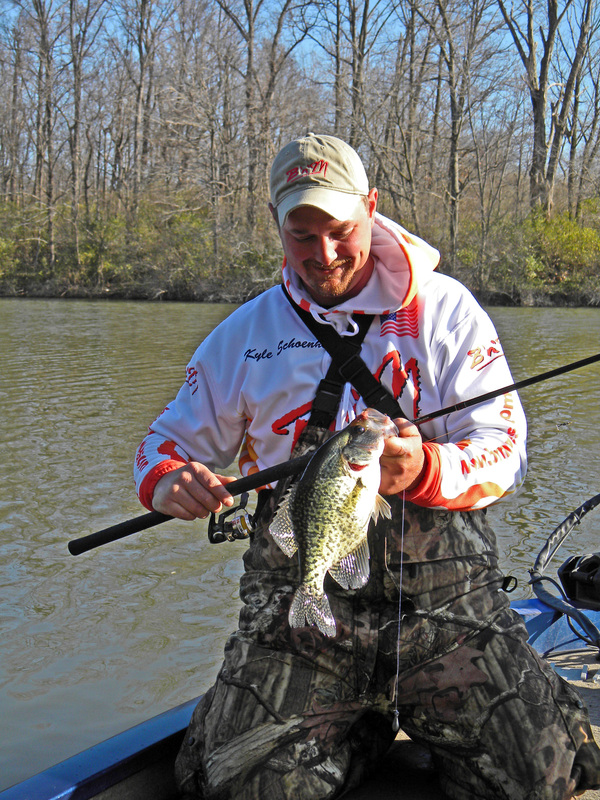 There are three basic methods to catch crappie: vertical jigging, dabbling, and casting/retrieving jigs. Vertical jigging involves parking over a known crappie location and dropping a jig straight down into it. A related technique is dabbling. This requires a long pole to drop the jig into pockets and holes in heavy brush or flooded cover. Using a short section of line, move the jig from one spot to another. It is jigged a bit and then pulled up and moved to another location. Casting jigs involves casting up a shoreline and then retrieving it with a slow swimming motion. Speeding up or slowing down the retrieve varies the depth at which the jig travels. Once fish are located at a specific depth, the angler concentrates on that depth. It is important to stay within five feet of the desired level, as crappies tend to concentrate feeding activity to one depth. You need to keep the jig right among the crappies. Larger fish are usually in a layer just under the smaller ones. Often in cold water the fish will suspend off of the bottom. Anglers can drop a jig to the bottom, then crank or lift it back up. Since crappies feed up due to the placement of their eyes, they will tell you what level they prefer their forage. You can then concentrate your fishing at that level. As with all fishing, it is important to keep an open mind, use the right equipment, fish slowly and try to keep your lure where there are fish. Big money purses and national sponsors make this tournament different from crappie tournaments of the past. Crappie USA is coming to Lake of Egypt March 10 and 11, 2017. With a total guaranteed local purse of $10,000 plus and chances at a national purse of $125,000 plus. Local sponsors are the folks at Williamson County Tourism Bureau. Information on the event is available from the Williamson County Tourism Bureau at 1-800-GEESE-99. It also is available at http://www.crappieusa.com/Tournament Informaton. Advance registration is required. The weigh-in site is Mack’s Lake of Egypt Marina, 12024 Laguna Dr., Marion, IL 62959. Crappie USA is a national organization formed in 1996 to establish and expand family-oriented, cost effective and competitive tournaments for amateur and semi-professional crappie anglers. Nationally there are tournaments in numerous states. Anglers compete for a place in the field for the “super bowl of crappie fishing” the $125,000 Cabela’s Crappie USA Classic to be held on Kentucky/Barkley Lakes out of Paris, TN October 26 to 28, 2017. Although the tournament is the main attraction it is not the entire event. On the evening before the tournament many national sponsor field test teams and local experts will be present to answer questions in a seminar. The seminar site, which is open to the public, will be the Williamson County Pavilion, 1601 Sioux Drive, Marion, IL. Starting time is 7:00 p.m.
On March 11, 2017 there will be a Crappie Kids Rodeo for kids 12 and under accompanied by an adult. Just bring your fishing pole. There is a sign up period from 8-9 a.m. and the fishing tournament will run from 9-11 a.m. All participants will be eligible to win one of six &1,000 scholarships to be drawn in October at the Crappie USA Classic. The site of the Crappie Kids Rodeo is the Marion Elks Lodge Pavilion located on the north end of Lake of Egypt near the dam. Information regarding the event is available from Williamson County Tourism Bureau, 1602 Sioux Drive, Marion, IL 62959 or by calling 1-800-GEESE-99. Information is also available online at Visitsi.com, the Williamson County Tourism Bureau website. Their e-mail address is info@visitsi.com.